During a lecture this week at Harvard’s Center for Government and International Studies (CGIS), Helen Zughaib recalled being asked by the State Department for a painting. Then-Secretary of State John Kerry was about to enter a new round of Israeli-Palestinian peace talks; could she produce something to present to the leaders of each side? The resulting work, Re Imagined Peace, depicts a cityscape of domed buildings and minarets in bright colors, painted over with geometric and floral patterns. There are no humans, only the vaguely Middle Eastern-looking city at peace in a stylized future. She and the diplomats worked on different schedules. By the time she finished the piece two months later, it was too late—the peace talks had already fallen apart. The Lebanese-American artist’s work is on display this month at CGIS, under the auspices of the Center for Middle Eastern Studies. Her paintings have been displayed widely in public collections, at the White House, the Library of Congress, and elsewhere; they often lend themselves to diplomatic optimism, even as they depict people in desperate situations: fleeing catastrophe in Syria, leaving home to emigrate to America, selling tiny items in the street to feed their families. 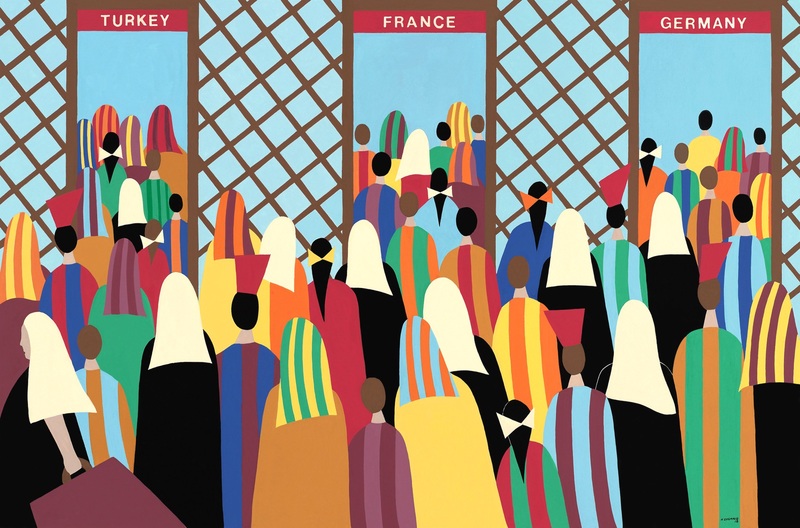 One piece, inspired by Jacob Lawrence’s paintings of African Americans migrating to northern cities, displays streams of Middle Eastern refugees pouring into doors labeled “Turkey,” “France,” and “Germany.” Zughaib’s version uses a more sanguine palette than Lawrence’s original; the migrants, women in colorful striped hijabs and abayas, a loose outer garment, appear still and unrushed. She is deeply concerned with the humanitarian impact of her work, but the tone of her paintings might seem to belie the full weight of the refugee crisis. She’s more interested in showing the quiet dignity of her subjects, the traditions and ways of life that they bring with them. This is part of her larger project to promote positive images of Arabs and Arab countries—she does so not by ignoring the ugly crises affecting the Middle East, but by drawing out of them the beauty of everyday life. Most of her pieces are done in gouache, an opaque watercolor that produces vivid colors with a matte finish. More recently, she has used mixed media like clothing, shoes, tiles, and wood painting, recalling the ways of life left behind or destroyed by war. Despite all that, Zughaib says she doesn’t view herself as a political artist: “I think of myself as somebody who’s talking about the people who end up paying the price for war. It’s women and children.” This, of course, is political, even radical, but she means “political” in a different sense. She’s not concerned with choosing sides in the Lebanese civil war or litigating the revolutions of the Arab Spring. Everywhere in her paintings, immigration is not a political but a moral issue. In Coming to America, a boat full of immigrants, among them Zughaib’s father, approaches the shore of New York City. Lady Liberty greets them against a backdrop of skyscrapers, stylized with inviting geometric patterns in soft blues and purples. “They stayed up all night because they heard they were going to see the Statue of Liberty,” she recalls her father telling her. The piece is the last from Stories My Father Told Me, a series interpreting her family’s old life in Lebanon and Syria. The cycle almost recalls the early paintings of Marc Chagall, reproducing scenes from everyday village life—the birth of a baby, gathering figs in the garden, carrying jugs to the water fountain—in flattened figures and saturated, dreamlike texture. 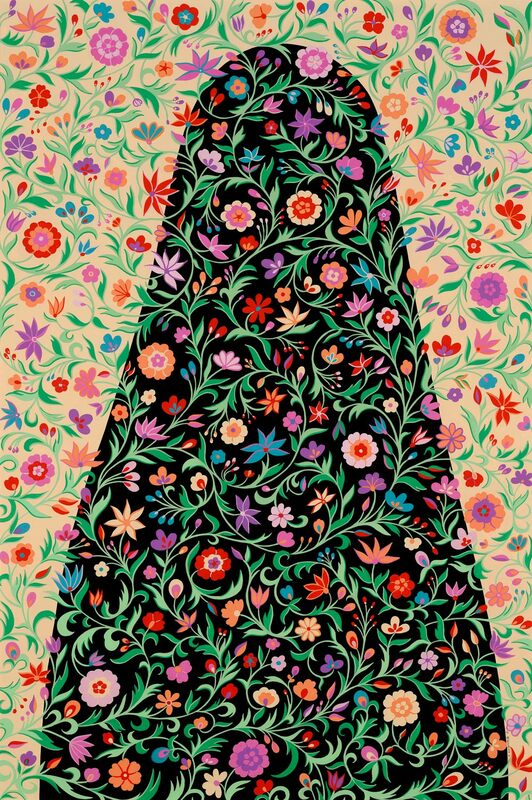 There are few men in Zughaib’s paintings; many pieces in her Arab Spring series display a single woman, represented by a silhouette of an abaya with flowers, Arabic words, or other patterns superimposed. She leaves it to viewers to determine the place of the woman in the Arab Spring (“Is she being swallowed up by that veil, or is she emerging?”). Others show women shrouded behind a mashrabiya, an intricately carved wooden window screen. Later, at a gallery talk following her lecture, a viewer asked how women in the Middle East feel about the abaya. Zughaib relates to her subjects like an anthropologist, and doesn’t like to be overly ideological in her analysis. Different women feel different things about veiling, she said, much as many Western women accept coercive rituals to look beautiful. 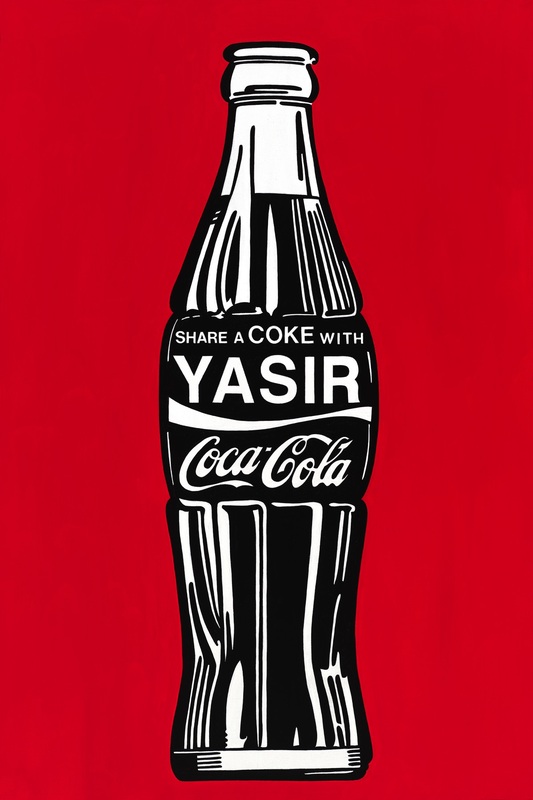 In some pieces, Zughaib uses humor to mask social problems. Another of her series riffs on the pop art of Roy Lichtenstein. In Abaya Driving, a woman in an abaya grips the wheel of a car—in some parts of the world, a subversive image. She stares at the viewer and leans intently forward, as if rushing to leave. The exhibition of Zughaib’s work, “Arab Spring/Unfinished Journeys: Humanizing Politics Through Art,” will be on view in the CGIS South Concourse through March 3.